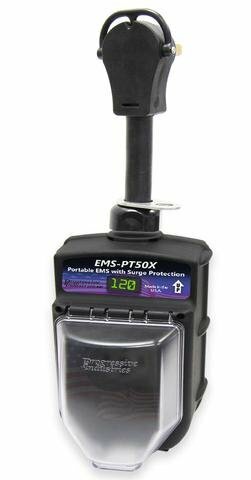 The EMS-PT30X and EMS-PT50X are the newest in our line of Portable Surge Protectors. We listened to what our customers had to say and made some impressive new improvements to the design and function of our most popular Portable EMS Surge Protector. Same great compact and easy to use plug-and-play application but now the EMS-PTX's come with an All Weather Shield Assembly, Rugged Pull Handle, Improved Secure Locking Bracket, Built-in Scrolling Digital Display and a Tough Lexan Housing. Electrical Management System (EMS) helps to protect your RV against voltage fluctuations, power surges and incorrectly wired shore power which can cause sever and costly damage to RV appliances and electronics. Improved design features include: state-of-the-art microprocessors, all weather shield assembly, rugged pull handle, secure locking bracket, built-in scrolling digital display and a tough Lean® housing. Sleek, compact portable design makes unit easy to use and store. Plug-and-play application.